Paryushana Parva is the most important festival for Jains; a festival through which we celebrate the qualities and essence of the Soul. These auspicious 8 days offer us an opportunity to focus on our spirituality with the hope that we will live a Jain Way of Life for the rest of the year. Disciplining oneself for these practices is a difficult task. Disciplining oneself for these practices is a difficult task. Our scriptures advise us to follow a strict diet during these holy days. Paryushana Meals was started with the intention of providing fresh and pure Jain meals to those who are willing but are unable to follow such restrictions. 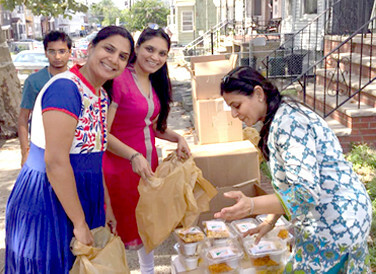 In September 2011, during Paryushana, we began this endeavor in the hope that Jain students and professionals residing/working in Manhattan, New York could avail of fresh food. In our busy lives, we are often incapable to pursue religious activities, especially food restrictions.